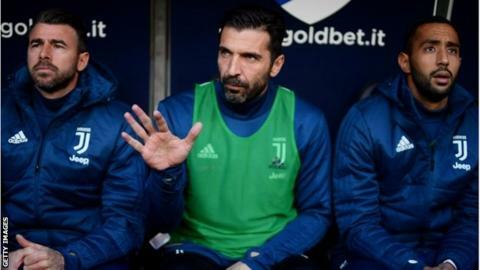 Gianluigi Buffon was left on the Juventus bench in their defeat by Sampdoria, along with defender Andrea Barzagli, because "they need time to get over" Italy's World Cup exit. Massimiliano Allegri rested the pair, who retired from Italy duty following the play-off defeat by Sweden. Sampdoria led through Duvan Zapata's looping header, with Lucas Torreira and Gianmarco Ferrari making it 3-0. Gonzalo Higuain and substitute Paulo Dybala scored injury-time consolations. Juve's first came from a penalty after Ivan Strinic fouled Douglas Costa - and then Dybala smashed home with seconds left. Juventus remain four points behind unbeaten leaders Napoli, while Inter Milan overtook them into second spot with their 2-0 win over Atalanta later on Sunday. The Turin side, who have won the last six Serie A titles, had the better chances early on with Higuain having a shot deflected wide and Mario Mandzukic and Juan Cuadrado both forcing saves following Higuain passes. But Sampdoria, who are sixth in the table, deserved their victory, scoring three times in the second half. Zapata's opener came after a Federico Bernardeschi mistake, with Torreira firing home their second from 18 yards and Ferrari tapping into an empty net. Goalkeeper Buffon, 39 - who is 21 appearances off breaking the Serie A appearance record - is retiring at the end of the season, unless Juve win the Champions League. Match ends, Sampdoria 3, Juventus 2. Second Half ends, Sampdoria 3, Juventus 2. Offside, Juventus. Daniele Rugani tries a through ball, but Gonzalo Higuaín is caught offside. Goal! Sampdoria 3, Juventus 2. Paulo Dybala (Juventus) left footed shot from outside the box to the bottom right corner. Assisted by Douglas Costa. Attempt missed. Karol Linetty (Sampdoria) left footed shot from the centre of the box is close, but misses to the left. Assisted by Gianluca Caprari. Attempt saved. Gianluca Caprari (Sampdoria) left footed shot from a difficult angle on the left is saved in the bottom left corner. Assisted by Karol Linetty. Goal! Sampdoria 3, Juventus 1. Gonzalo Higuaín (Juventus) converts the penalty with a right footed shot to the centre of the goal. Gastón Ramírez (Sampdoria) is shown the yellow card. Penalty Juventus. Douglas Costa draws a foul in the penalty area. Penalty conceded by Ivan Strinic (Sampdoria) after a foul in the penalty area. Corner, Sampdoria. Conceded by Blaise Matuidi. Attempt blocked. Valerio Verre (Sampdoria) left footed shot from outside the box is blocked. Substitution, Sampdoria. Gianluca Caprari replaces Fabio Quagliarella. Attempt saved. Douglas Costa (Juventus) left footed shot from the centre of the box is saved in the centre of the goal. Assisted by Paulo Dybala. Attempt blocked. Paulo Dybala (Juventus) left footed shot from outside the box is blocked. Assisted by Sami Khedira. Offside, Sampdoria. Lucas Torreira tries a through ball, but Fabio Quagliarella is caught offside. Substitution, Juventus. Blaise Matuidi replaces Miralem Pjanic. Goal! Sampdoria 3, Juventus 0. Gianmarco Ferrari (Sampdoria) left footed shot from very close range to the centre of the goal. Assisted by Fabio Quagliarella following a set piece situation. Duván Zapata (Sampdoria) wins a free kick on the right wing. Lucas Torreira (Sampdoria) wins a free kick in the defensive half. Attempt missed. Paulo Dybala (Juventus) left footed shot from outside the box is close, but misses to the right from a direct free kick. Substitution, Juventus. Douglas Costa replaces Juan Cuadrado. Goal! Sampdoria 2, Juventus 0. Lucas Torreira (Sampdoria) right footed shot from outside the box to the bottom left corner. Assisted by Gastón Ramírez.